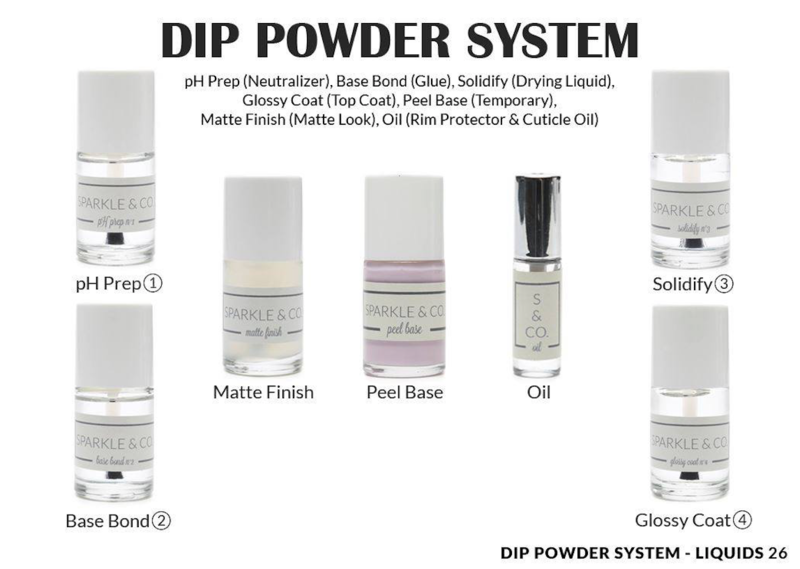 Deluxe 6 Piece Dip Powder Starter Kit - Choose Color - Sparkle and Co.
(1) Oil (Cuticle Oil and Rim Protector – use around rim before shutting Base Bond and Glossy Coat each time to allow easier opening next time you use it). This set is what I started out with, and I have to say it is everything that I needed to start out! The liquids are easy to work with; I’ve had them for a few months and haven’t had any issues at all. The brushes are high quality, and the bottles are thick. Liquids themselves are super easy to work with and don’t need any thinner or extra products to keep them intact. Overall, I would HIGHLY recommend this kit as the one to start with! Price point is also perfect for starting out, AND you get a few colors, which is great when starting out. Tip-be sure to clean the top rim of the base bond bottle with a rag dipped in acetone, then follow with the oil around the rim. This will keep it from sticking shut! 10/10 would recommend to friends and fam! I ordered this set to get started on my journey of nail dipping. I was a little intimidated at first but with clear instruction here and in the groups I was able to Tahoe my nails. This set is amazing comes with every thing you need to do a set of dip nails. The dipping process is simple easy and fast! The product was clearly labeled steps, easy to apply no smell to the product. 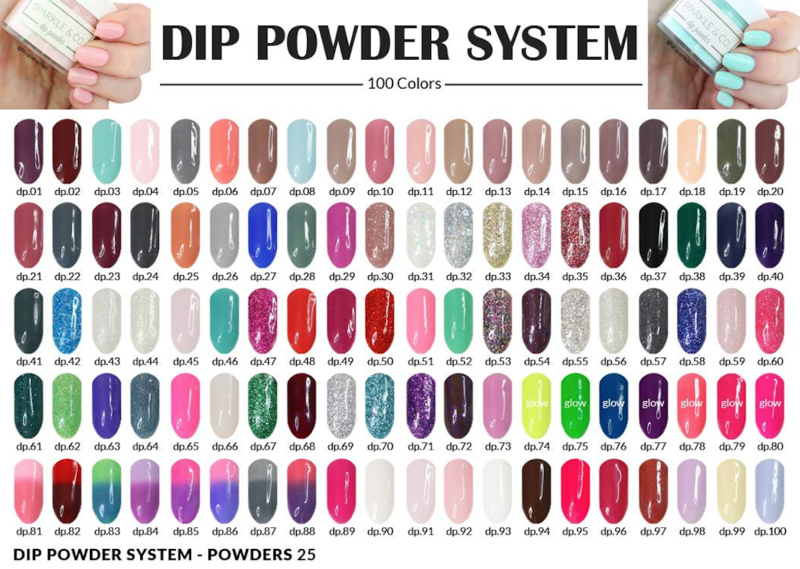 I also love that I’m able to choose a colour of my choice for the dip powder. I ordered last week it arrived a week later and I’m in Canada! So shipping time is super fast, customer service is amazing! I have used several different brands of both liquids and powders. Sparkle & Co liquids last,they are so thin and easy to work with & the shine you get is out of this world. Plus, the phprep is a game changer! It helps the liquids and powder bond to your nails to prevent lifting and make for a long lasting mani and it works! My manicures last 4 weeks, possibly longer using Sparkle & Co products. They really do speak for themselves. As for the powders, mind blown! Every single color is incredible. I started May 2018 with Sparkle & Co with 1 color and 4 months later, I can happily say I am the proud owner of every single color. Sparkle & Co powders are hands down my favorite. Coming from someone that owns 400 powders from several companies, that speaks volumes. Not only are they stunning, incredibly fine and smooth and sooo easy to work with, they just make you feel good. Nails are my passion..I express myself through my nails and they make me feel beautiful. And Sparkle & Co just makes that happen. All of the products are flawless and I am like a kid on Christmas morning when I get a new color. They make me feel beautiful everytime I have them on and I would recommend Sparkle to anyone and everyone. Xo I am a customer for life! I had a different brand of liquids and had so many problems with them. I found a nail dipping group on Facebook and so many ladies recommended the Sparkle and Co. liquids. I ordered them and wow! GAME CHANGER!! They are so easy to use! There are great instructions and they make the process so easy. Can we talk about the solidify liquid? It smells like cupcakes and I have no issues getting my topcoat (which is soo shiny!) to go on smooth!! So happy I found Sparkle and Co.! I ordered this set as my very first set because of the great things I had heard about S&C liquids. I can say they did not disappoint!! 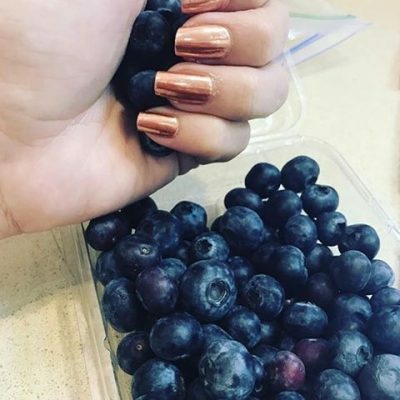 I have only done two manicures but it’s so easy and so far all of my colors have been beautiful! My husband normally complains for hours after I’ve done my nails because of the smells that linger around the house but the other day I did a full dip manicure right next to him and he said he didn’t smell a thing! I loved this starter kit and can’t wait to grow my collection!